In addition to being a unique husband and wife team, Drs. Ken and Roxane combine their years and areas of expertise and have expansive continuing education hours, as well as an extensive pharmacology background to provide a broad spectrum of dental services, from pediatrics to geriatrics. Upon graduation from dental school, Dr. Spence served on the faculty of the UTHSC Dental Branch as a full-time professor in the Department of Community Dentistry for seven and one-half years, while maintaining a part-time private practice in Houston. 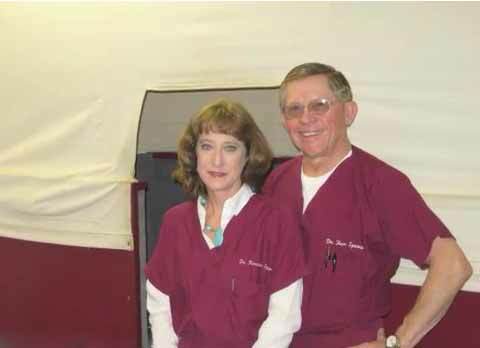 In 1992 he relied on his previous degree as a registered pharmacist, when he took a position at TAMU Veterinary School of Medicine as the pharmacy director while he and his wife, Dr. Roxane, established Aggieland Dental Associates. Dr. Roxane Micak-Spence is a proud Texas A & M Aggie class of ’85 graduate; she also graduated from UTHSC Dental Branch in Houston. Before returning to College Station she spent four years in a specialist’s office practicing orthodontic and pediatric dentistry in her hometown of Houston.